Listen to Monty Python's description of Bubba. 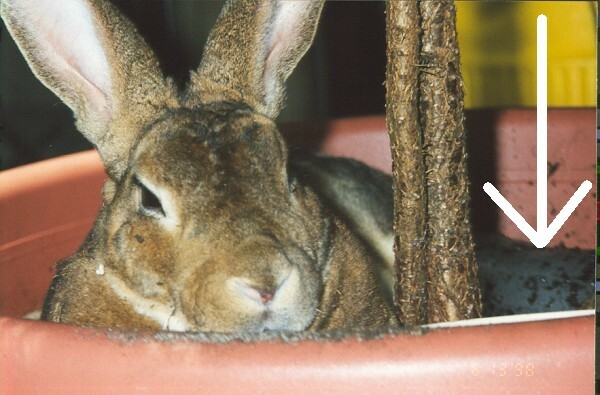 Bubba Approves of the Disapproving Rabbit - you must see this! Bubba is a 4lb Mini-rex that was rescued by the wonderful folks at the Humane Society of North Pinellas. He was found in Oldsmar by some children who noticed he had a 2" gash on his lower back and cuts on his ears. 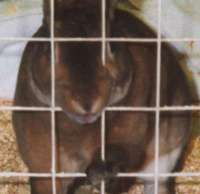 They trapped him with a laundry basket and called the Humane Society, who brought him back to health. Bubba is very social, loves people, but likes to show his affection by nipping. 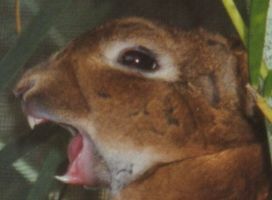 These razor-sharp teeth really get your attention, especially when he gets your neck. His nipping, beautiful auburn neck ("redneck", get it?) and other crazy antics have earned him the name crazy Bubba. Click on the left picture above to see him trashing the kitchen with his litterbox and chewing on the gate. 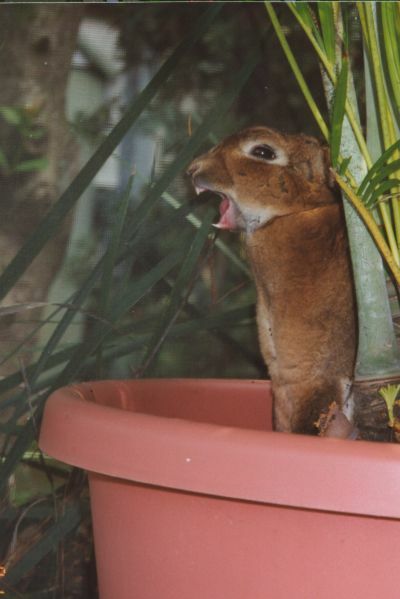 The right picture looks like he's ready to attack, but click on the picture and you'll see he's just yawning while relaxing in a favorite flower pot. Bubba is short for Beelzebub - bee el' zuh bub - (Gr. form Beel'zebul), the name given to Satan, and found only in the New Testament (Matt. 10:25; 12:24, 27; Mark 3:22). It is probably the same as Baalzebub (q.v. ), the god of Ekron, meaning "the lord of flies," or, as others think, "the lord of dung," or "the dung-god." ). This definition is from Easton's 1987 Bible Dictionary. 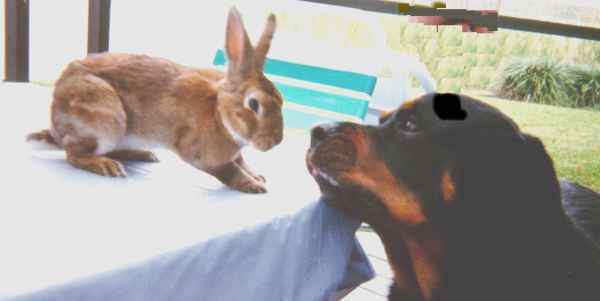 We expected Bubba to be deathly afraid of Sparky (left pix), a 125lb Rottweiller. He loved Sparky at first sight and never showed any fear. Sparky returned the favor with a gooey tongue bath. The friendship continued with Scooby (right pix). He's smart, already learning to be a good table rabbit. Here he enjoys the Lake Tarpon view from the porch. He figured out that ripping straws out of drink cups can be fun. 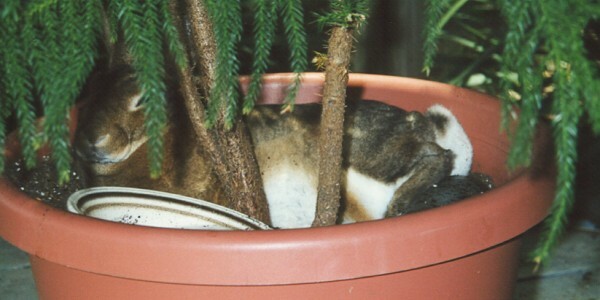 Laying outside in his favorite tree pot, next to a bowl of water. He's laying next to a block of ice (see arrow) on a warm day. Slave Deb administering the mandated cheek scratches. I own you. Bring food. Now. On road trips, he likes to lay on the floor under the brake pedal and the vibrations lull him to sleep. Yes, that's my right foot on the gas pedal. 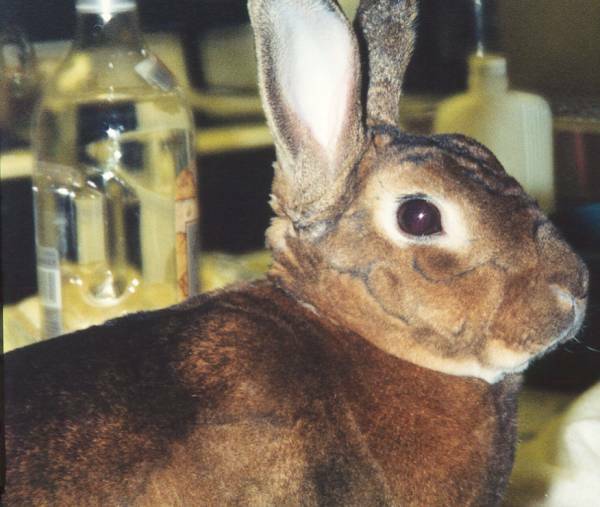 Mini-Rex fur changes color from root to end. 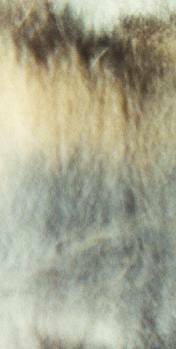 Left pix shows fur spread apart, skin in the middle. Right pix shows a section of shedded fur, where the bottom is the root. It changes from white to black to brown to black. The topcoat color remains somewhat consistent throughout the year with a brown/black mix on top and bright white on the underside. 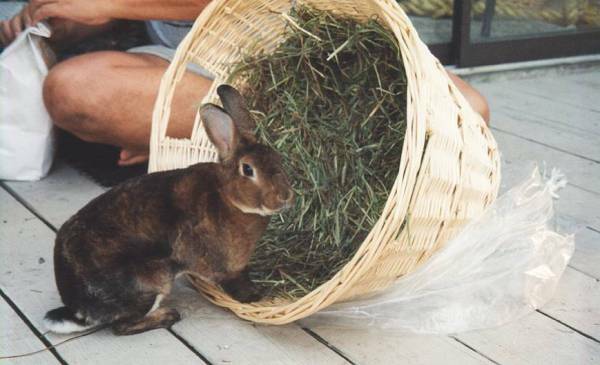 Christmas brings a basket of wonderful hay from Oxbow Hay Company. 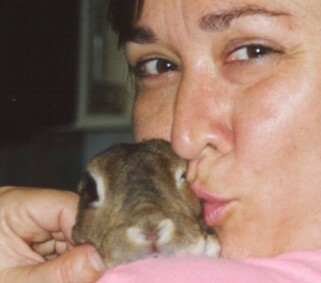 This Memorial Day Weekend (May 2005) our little Bubba has taken his last road trip, across the Rainbow Bridge. 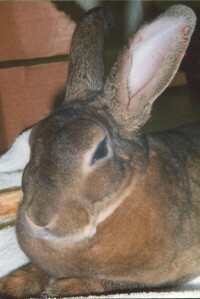 Earlier this month Bubba developed a large abscess on his left hind leg, in the area of his break. 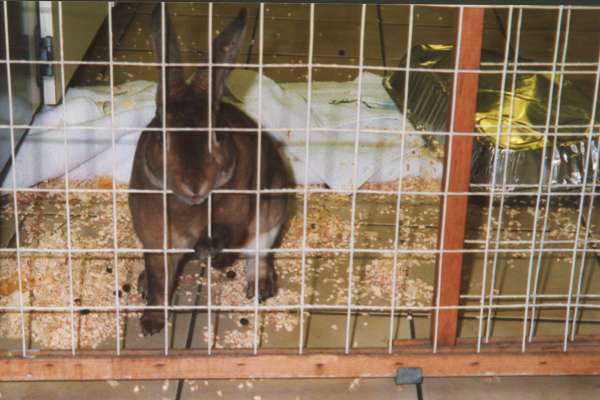 I don't know if it was the medication or the system wide infection that caused his rapid decline but in the end he was very weak, unable to stand or hop around and did not have the energy to eat on his own. He died on Saturday, at home, with Paul and I giving comforting words and pets as he departed. It's comforting to tell folks that Bubba has "gone camping". Pontoon boat camping at the Suwannee River over Memorial Day weekend has been an annual tradition for the last 18 years, and we had the joy of Bubba's company for the past 6 of them. Bubba loved every aspect of the trip from the time we left home in the Expedition, to digging in the sand at the beach & swimming in the river, to watching the crowds in Rock Bluff Springs from atop his cage, to running around the boat at night, hopping up on us for pets. This year we stayed home because Bubba was just too sick. 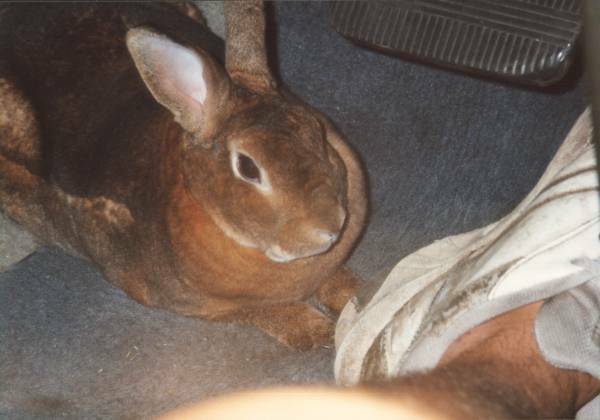 He was a tough bun (who turned into a big sweetie-bun) who loved dogs, people, parties, pets and road trips. Besides Suwannee River, Bubba's travels included house-boating in Key West & Boca Grande, visiting the family in Miami FL, Marienville PA, Arlington VA and Corolla NC, with stopovers in many different hotels along the way. We loved him dearly and miss him very much.